The General Assembly of the United Nations on the 22nd December 2005, identified solidarity as one of the fundamental and universal values that should underlie relations between people in the 21st century, and in that regard decided to proclaim the 20th December of each year the International Human Solidarity Day. Every year on the 20th December we celebrate unity in diversity: developing a culture of solidarity and a spirit of sharing in order to achieve social justice and combat poverty. In the United Nations Millennium Declaration 189 world leaders identified solidarity as one of the fundamental values essential to international relations in the 21st century: “Global challenges must be managed in a way that distributes the costs and burdens fairly in accordance with basic principles of equity and social justice. 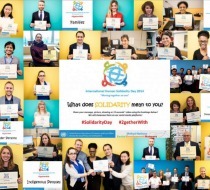 Those who suffer or who benefit least deserve help from those who benefit most.” Convinced that a culture of solidarity and a spirit of sharing were important for combating poverty and delivering the eight Millennium Development Goals, the UN General Assembly proclaimed 20 December as International Human Solidarity Day. Global citizenship refers to a sense of belonging to the global community and common humanity, with its members experiencing solidarity, collective responsibility and identity among themselves. The sharing of experiences and good practices – be it about how to prevent risks, protect our cultural heritage or our environment – forms a very important part of such solidarity. International solidarity is also the basis for dialogue, the eradication of poverty and lasting peace, as stated in the Millennium Declaration. On this day (20th December) the Slovakian Grand Priory of the Sovereign Order of Saint John of Jerusalem, Knights of Malta, Federation of the Autonomous Priories (KMFAP) organises a large-scale Charity Concert in Trnava (Slovakia) in the municipal theatre. The total amount of donations received during the event will be delivered to the Children’s Hospital of Luanda (Angola).